Last week I was asked to write up an aquatic vegetable list for a water garden/hot tub pond. Let’s take a look at some of the easiest and tastiest. Kangkong covers the ground and can grow in moist soil or standing water. Photo credit. 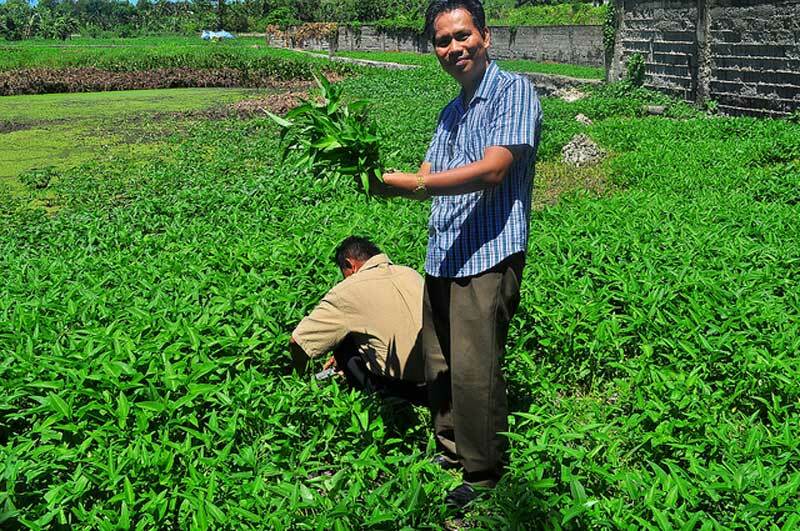 Kangkong is a relative of sweet potatoes that you’ll only find in Asian markets. In some states it’s classified as an invasive so getting plants from a nursery may be impossible. Seeds are available online, though I don’t recommend growing it if you’re in a place where it’s illegal. 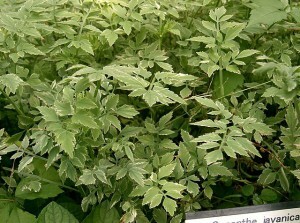 The leaves and young shoots are edible raw or cooked. Steamed, they taste mild with rich mushroom and asparagus undertones. You can sometimes find these greens at Asian markets. They’ll eat your entire pond, so watch out. Very productive and VERY fast-growing. Taro for sale! Photo credit. I’ve written a little on taro before but haven’t grown it very much. 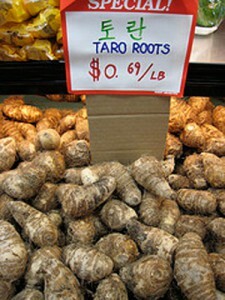 My friend Mart grows taro in his aquaponics systems and has been working on boosting his root yields. They love the water. 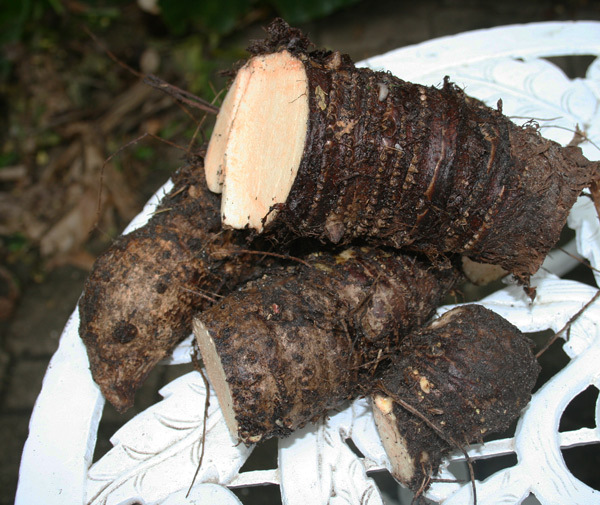 Be careful when cooking taro, however, because the oxalic acid crystals in the raw roots and leaves can mess you up. Look it up online and prepare it properly, then it’s a great crop. 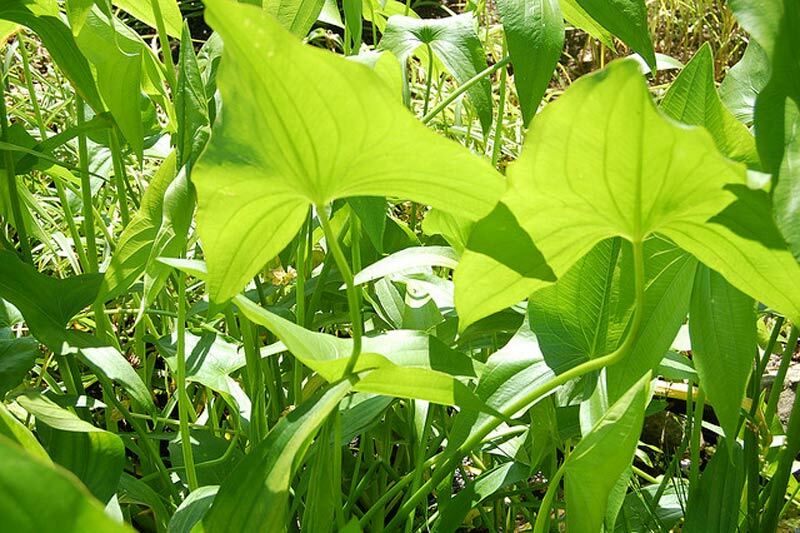 Chinese water chestnuts are an easy-to-grow aquatic vegetable that rapidly fills a space. They’ll choke out some of the competition, so plan accordingly. The downside of Chinese water chestnuts is that they’re rather a pain to process; however, the flavor of the fresh corms is marvelously sweet and nutty. Water celery is more of an herb than a real aquatic vegetable. Though water celery doesn’t set stalks, it does have a rich zippy celery taste that will spice up any batch of chicken soup. 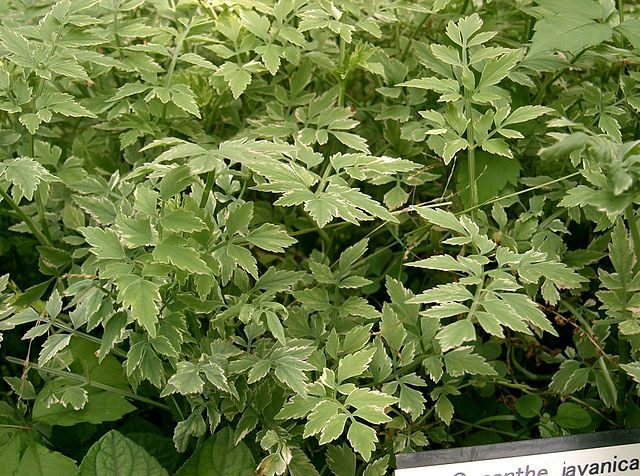 It’s a low-growing, clumping plant that spreads to fill up a space – keep it contained! Bonus: water celery looks beautiful, particularly the green and pink variegated form. Duck potatoes are one of those aquatic vegetables you rarely see in cultivation. Photo credit. Duck potatoes used to be a wild-harvested aquatic vegetable of the natives and is still sought after as an excellent wild food. They grow easily in a sunny pond and will yield tasty tubers for the table in the fall. Green Deane covers duck potatoes here. 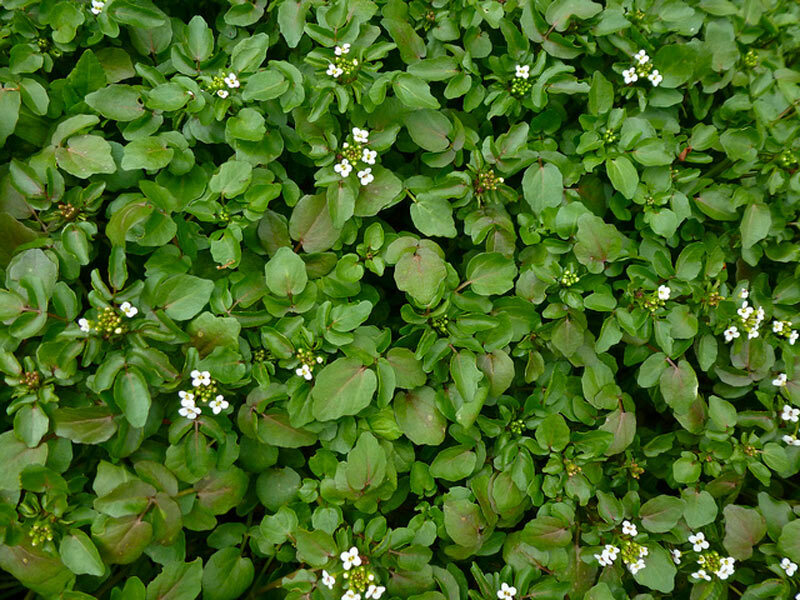 If you live further north, why not give watercress a try? 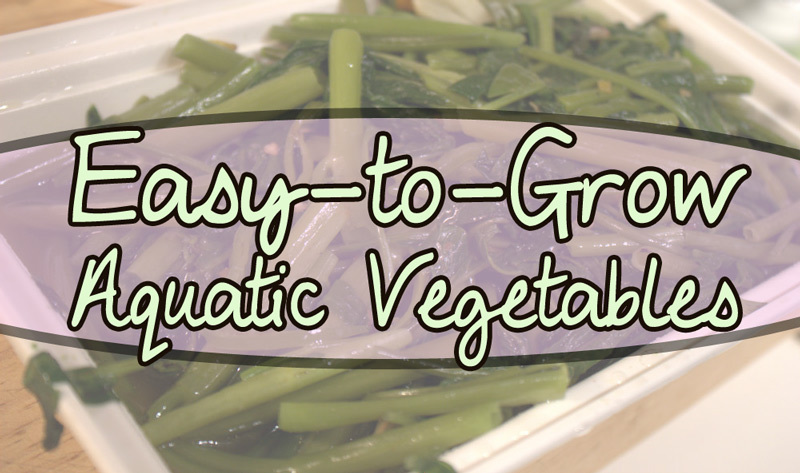 This is one of the few commonly cultivated and wild harvested aquatic vegetables from outside the tropics. Watercress is in the mustard family and likes running water the best, though it’s not strictly necessary. I’ve gotten it to root in a glass of water from bundles of watercress I bought in the grocery store. You can also start watercress from seeds. If you have shallow muddy areas along the edge of your pond, try planting a few of these semi-aquatic vegetables. Grow a garden in your pond and get malanga roots. Malanga grows great with lots of water. It’s an easy root vegetable and tastes good. It also requires a lot less processing than its oxalic-acid rich cousin taro. Even the young leaves are edible when well-cooked, making it a root and a green. 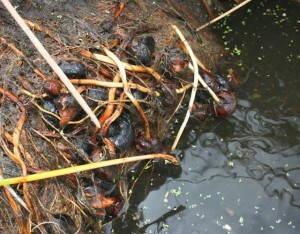 A friend of mine threw some roots in her pond once… and they kept growing, even though they were in standing water. Though that’s not normally the way malanga grows, it sure didn’t mind it either. Ground nut, also known as Apios americana, is a native North American plant that likes to grow in moist areas. Provide it a trellis so it can climb and it will come back year after year and provide you with lots of tasty roots. 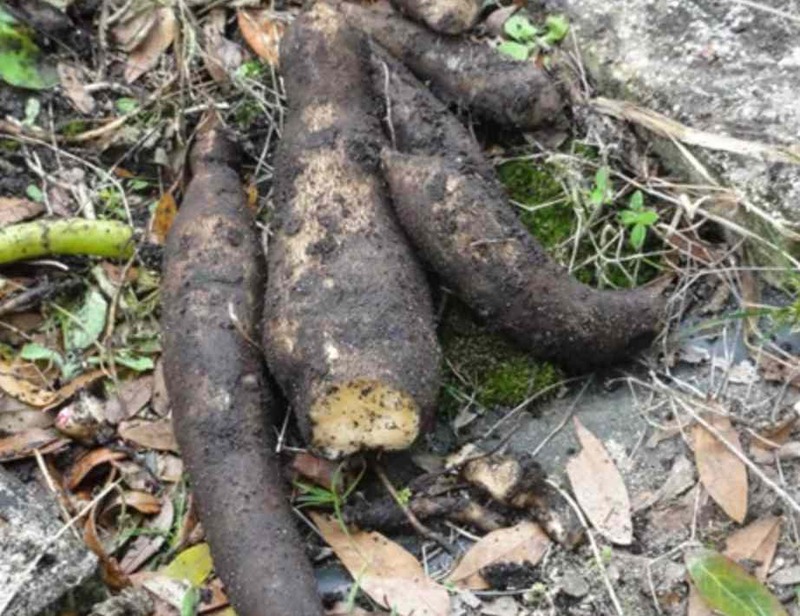 Growing yacon roots isn’t hard, provided you have plenty of moisture. Yacon seems to really like constant moisture. Try it along the edge of your pond – I’ll bet it will be happy. This crop from the Andes has tasty sweet roots that can be eaten like an apple or turned into a syrup with a remarkably low rating on the glycemic index. Though not truly a water vegetable, it should do great unless it’s totally soaked. Now that you have a list of aquatic vegetable choices… what are you waiting for? Gardening in a pond is so easy you’ll wonder why you hadn’t done it before. Two words: no watering. Go hunt down some cool water vegetables and start planting. One of my favorite sources for rare vegetables (which also contains more aquatic choices that are not on this list) is Eric Toensmeier’s book Perennial Vegetables. Pick up a copy – it’s great reading and will open your eyes to the many wild and wonderful crops most gardeners overlook. Mine has been well-thumbed through and read in detail at least twice – and every time I pick it up I find something new I missed. Buy at my link and I’ll make a buck or so commission – and it doesn’t cost you a penny more. So – how about you? Anyone growing some cool aquatic vegetables I left off my list? Great! I have a small shallow pond next to my aquaponic system. I ordered the kang kong a few weeks ago. I also have Okinawa spinach and cranberry hibiscus sitting in pots in the shallow pond: they seem to be doing okay. I am putting the leaves in smoothies along with bidens alba(Spanish needle). The main thing is that I am having lots of fun. thank you again for all you do, thank you for this list. Sounds like a really healthy smoothie. I also add longevity spinach, Surinam purslane and moringa to mine. As long as I don’t go too heavy, the taste doesn’t get overwhelming. I forgot… I have tried putting malanga in big pots and putting in the shallow pond(3-5 inches deep) without results. How long before they should sprout? Usually within a few weeks. Check and see if the roots have rotted. I am surprised you skipped cattails they can grow as far south as zone 9 which is mid Florida. I have a similar problem with captcha as you. Its really annoying when they ask for something that is an ingredient in other things like eggs that are in cakes or when edible flowers are not accepted as food. Yes, you’re right. CAPTCHAs hate taxonomy. I am growing cattails as well but I haven’t harvested any yet. They grow wild all over the place, so I figure the world is my cattail garden. Suggestions on where to buy such plants? And as always, thanks for the great info! Oriental markets, edible plant nurseries, ebay, permaculture groups and garden groups on Meetup.com. Those are my go-to places. Eric Toensmeier’s web site for his book has lists of nurseries across the US that carry some of the plants he recommends. You can sort through the nurseries by region and/or climate. Thank you for the list of veggies. I have been given some water cress and am considering planting it a terra cotta pot and setting the pot(s) on the seat of an old hot tub that no longer works. I plan to add enough water to keep the lower 2-3 inches of the pots submerged, maybe add a solar powered water fountain for some water circulation. Is there any concern about chemicals that may leach out of the whatever a hot is made of, into the water and eventually into edible plants? thanks for you thoughts! I’ve thought on that myself. I only used aquarium-safe silicone when I worked on mine. There’s always a chance though that the tubs themselves are made of something that will leach. I couldn’t find any good info saying they were toxic, plus I saw multiple other folks had done the same thing and had happy fish, so I went for it. The frogs love my ponds and they’re usually quite susceptible to toxins.